Not one of the 10 projects in line for portions of a $75 million Miami-Dade County economic development fund has met all criteria commissioners requested, but four have made requests that aren’t deal-breakers and might be negotiable, according to a report released last week on where the proposed grants now stand. The mayor’s staff split the 10 projects into three categories: those needing little additional negotiation (four projects), those needing significant additional negotiation (three projects) and those needing significant additional negotiation as well as a county lease for site control (three projects). Grant money is not to be disbursed until the projects, including infrastructure work, have been completed and all permanent jobs promised in the grant application are in place for at least a year. Once the projects prove those two terms have been met, the county is to write a check for the grant. Once payment has been made, the recipient must post a letter of credit, or similar guarantee, in the amount of the grant payment for five additional years to assure the county that all the permanent jobs promised remain in place for at least that long. Those were major policies that the commission adopted and county staff has not deviated from them, the report states. Leland Saloman, a deputy director in the Department of Regulatory and Economic Resources, met with each applicant at least once to discuss the projects and listen to ideas or objections before submitting his report within a deadline that the commission set in early February. The county attorney’s office prepared a standard grant agreement that included the three non-negotiable conditions and other requirements of the Building Better Communities General Obligation Bond program. All applicants the commission previously approved to proceed with negotiations received a draft grant agreement April 3 and a revised draft grant agreement – with the requested revisions – June 19. The most requested change was to the new job requirement, which the county defines as permanent full-time equivalent positions (36 hours a week or more) from new businesses located in the project, existing businesses relocating to the project or area as a result of the project, and local business expansions. Another challenge that arose during discussions with project leaders included alteration or deletion of the clawback provision, the stipulation that requires proof each of the five years after the first that the jobs are still in place. The percentage of the jobs no longer in place is the share of the grant that the developer must return to the county. Other change requests included major alterations to the scope of the development project and projects requesting time extensions because they don’t have site control. The next step is hearing what direction county commissioners want to take, Mr. Saloman said. His department isn’t authorized to negotiate on the grants until the commission directs it to do so. When the commission discusses the report, which Mr. Saloman said he assumes will be Sept. 16, commissioners could decide to do whatever they want, including instructing staff to continue all negotiations, continue only some, or even take all the money back and start over. •Larkin Health Sciences campus in Naranja, slated for $5 million to help construct an Osteopathic School of Medicine, school of pharmacy, school of nursing and school of dentistry, as well as create a charter high school for life sciences and a residential student housing component. The project application promised 245 new permanent full-time jobs at an average salary of $89,959. The requested changes are for the salaries, with no projection based on a new method of calculation, which is a minimum of 10% or higher of the Miami-Dade County average per the Florida Department of Economic Opportunity Statistics for the applicable fiscal year. •RiverLanding Miami, with a $7.5 million grant to construct a mixed-use development, including a linear park on the Miami River, with about 426,000 square feet of vertical retail, 500 market rate rental apartments and 2,500 parking spaces at 1400 NW North River Drive along with pathways around the project, a seawall, river walk, roads, sidewalks, and public signage lighting. The project promised 980 new permanent fulltime jobs at an average salary of $28,163. The requested changes are to build the space based on tenant demand and in compliance with City of Miami approvals; the ability to alter the number of jobs as long as the revision doesn’t materially alter the original project or cost by greater than 15%; and that the clawback period be four, rather than five, years. 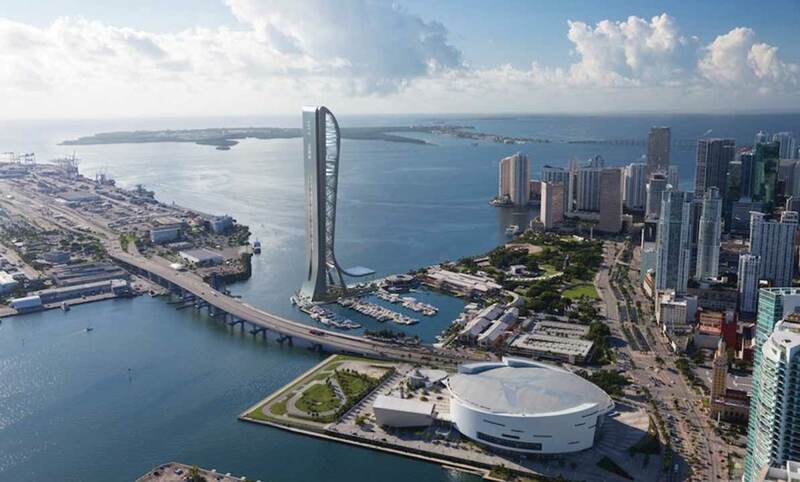 •Skyrise Miami, for $9 million, for a project that is to to construct an observation tower at 401 Biscayne Blvd. and attractions including a private club, nightclubs, restaurants, interactive exhibits, ballroom and private events spaces, amusement rides, the Skyrise theater and retail shops. The project promised 571 new permanent full-time jobs at an average salary of $35,000. Changes include improvements to a publically owned marina and roadways, the creation of new expansion of a publically owned existing garage, and public spaces including an extension of the existing Baywalk. •Westview Business Park, a $7.5 million grant to help construct retail and industrial space totaling up to 2 million square feet north and south of Northwest 119th Street, west of 22nd Avenue and east of 27th Avenue. The project promises to create 300 new permanent fulltime jobs at an annual salary of $32,000. The project changed in scope and revised the clawback provision. •Carrie Meek International Business Park, with a $5 million grant to help construct an industrial park with aviation and non-aviation components totaling 1.75 million square feet over a five-year period with parts along the eastern boundary of the Opa-locka Executive Airport. The project was to create 2,300 permanent fulltime jobs but has changed that number to 1,650, based on the formula of one job per 1,000 square feet, at an average annual salary of $44,035. Other changes include a reduction of total square footage to 1.65 million over a seven-year period in four phases and a request for a proportionate share of grant funds at the completion of each phase. •Orion Jet Center, with a $5 million grant to help build an 18,000-square-foot Class A terminal building, 28,000 square feet of offices and 200,000 square feet for aircraft hangers at 14850 NW 44th Court in Opa-locka. The project was to create 126 new permanent fulltime jobs at an annual salary of $52,353 but changed that to 31 direct and 26 indirect jobs at an average salary of $41,432. The applicant deleted the conditions precedent and says his project is complete. •Overtown Gateway, with a $6 million grant to help construct a mixed-use, mixed-income development featuring rental apartments, retail, commercial office space and hotel lodging at 152 and 249 NW Eighth St. The project was to create 423 permanent fulltime jobs but the applicant changed the wording to “anticipates that the project will result in the creating of 571 new jobs” and deleted the requirement of keeping new jobs in place for five years, the provisions for certification of jobs and the clawback provisions. •Miami Ocean Studios, with a $10 million grant to help construct a state-of-the-art film and television studio with a technology center featuring a digital media village as well as an upscale hotel with retail exceeding 900,000 square feet at 20000 NW 47th Ave. The original number of 2,684 permanent fulltime jobs was changed to 50 over a five-year period with the remainder of the 2,634 being indirect jobs. •Miami Wilds, with a $13.5 million grant to help construct an entertainment cluster including an adventure theme park, water park, 400-room hotel/conference center, retail shops and a movie theater adjacent to 12400 SW 152nd St. There were to be 2,758 new permanent full-time jobs at an average annual salary of $36,270. However, the applicant is now proposing the project be built in two phases, given ongoing environmental concerns for the site where part of the project would be constructed, and changed the number of jobs to 403 to be built in the first phase with an average annual salary of $35,620. •Aviation Corporate Hangar, with a $500,000 grant to help build a 45,623-square-foot corporate hangar at 14933 NW 41st Ave., which was to create eight new permanent fulltime jobs. However, the applicant sent an email July 12 saying it would not be submitting an agreement by the deadline.